identify its relatives (words sharing he same base). Ultimately students will use this information to consider the word in relation to Odysseus and other heroes. Is determination a heroic quality? Is it free will or predetermination that governs heroes’ choices? Students worked in groups to establish the morphemes. There was some confusion in one group with: <deter+min(e)+ at(e) +ion >. Despite the miscue here, I was really pleased to see that this student recognized <-at(e)> as a suffix and that the vowel suffix <-ion> had forced a change – removal of the final non-syllabic ‘e’. Others immediately spotted <de-> as a prefix and someone said that ‘mine’ could not possibly be a base element as it had nothing whatsoever to do with the meaning. Most groups rapidly established that the elements were in fact: <de+ term+in(e)+at(e)+ion>. A British student recognized ‘term’ as a free base element as his former school had been divided into ‘terms’ and others were quick to point out several related words. Life in the tropics often involves unwanted guests in the form of cockroaches, rats and mosquitos and we want these exterminated from our houses! So ‘extermination’, and our pest-ridding hero- the ‘exterminator’ were rapidly recognized as sharing the same base element. Naturally ‘terminator’ was quickly spotted, thanks to Arnold Schwarzenegger,and added to the list. Liam shared his discovery concerning <interment> and <determine>. Although he uses “short for” instead of the term the root, he nevertheless shows critical reasoning and excitement about his research. We discussed several times that although you may have had to look for the words within a word as a spelling activity in the past, it does not help in understanding the meaning or the word’s structure. In fact it’s a hindrance! Today we really emphasized that the ‘spots’ in dictionaries indicate syllables and not morpheme boundaries. I think this will need constant reminders as a few students gravitate to these syllable divisions assuming that this representation must be the same as the morphemes. We traced the root to Latin terminare and terminus. We read that ‘term’ was a doublet of ‘terminus’. (Noted, but more research for me to understand this! At this point not a critical piece of knowledge for the students). 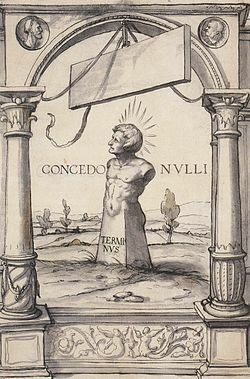 Students found the links to the Roman deity Terminus ruler of boundaries and limits via the Online Etymology Dictionary! So tomorrow building a matrix to contain all possible words- hence the sorting of data into elements so teams can learn how to operate the mini-matrix maker. This sorting into elements and deciding what is related to the free base <term> involves considerable checking to ascertain whether the roots are the same as well as reinforcing knowledge of prefixes and suffixes. Liam does a brilliant job of explaining ‘interment’, why its structure is ‘in + ter + ment’ with the base element ‘ter’ that has the denotation “earth”. I hope he doesnt mind that I have taken a copy of the film to use in workshops here in France. That way, when anyone here asks me about ‘interment’ I can just say to them, “Watch this; Liam will will explain it to you”. Actually, there is another, completely separate, base element that is spelled ‘ter’ that has the denotation “frighten” – we see it in the verb ‘deter’. I thought that Liam would not be terrified by that fact and could do a terrific job of explaining it.